Here’s what I love about this. Each tiny block is an exercise in colour. I can try out dozens of different colour palettes without committing to an entire quilt or large scale project. I can be experimental, spontaneous and playful without worrying about the outcome. It’s soo much fun! Also, I’m using up tiny scraps. A lot of these are leftovers from all my past projects or leftovers from YOUR past projects. I’ve been swiping your little scrap bin throwaways for months and finally I’m using them. This particular block was inspired by a spread in one of my visual diaries. 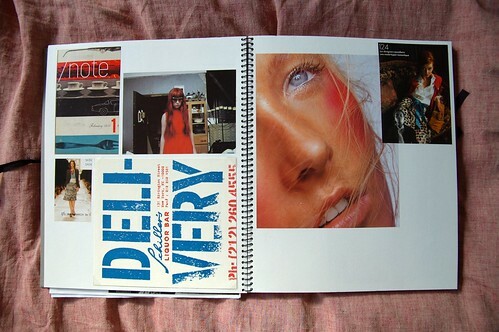 I’ve been making these visual diaries/collage/scrap/inspiration books since university. It is one of my favourite all-time activities to sit down with my bottle of rubber cement and endlessly arrange the bits and pieces of magazines clippings and ephemera that I collect. Every time I open one of my books I’m immediately inspired. 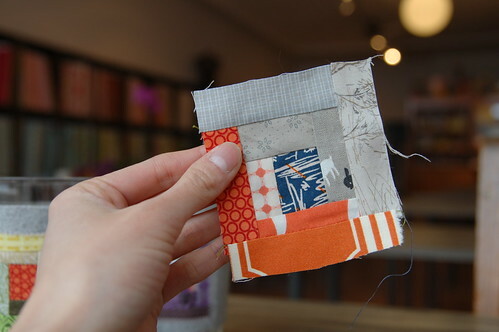 This particular colour palette stood out and I gathered my orange, grey and navy scraps. These are colours that I never would have put together on my own, but they look so delicious! 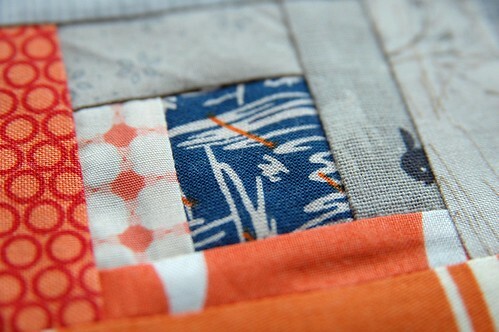 A crafty nod goes to Jen, whose log cabin heart medallions made me want to do tiny patchwork. I LOVE this colour combination!! And what a great way to use up timy scraps. beautiful. i think grey is one of the most under-appreciated colors. quite wondrous! i really like the varying textures of the orange against the softer grays and blues; the center square of deep navy really catches the eye. i would definitely sew this to a favorite shirt or apron. Oooh…I like this. I’ve recently been thinking that English paper piecing would be fun to try, but the log cabin is more familiar. (and doesn’t require cutting the paper AND the fabric) Thanks for the inspiration!